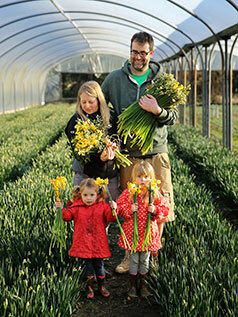 Our Cornish Daffodils are available to send by post from New Year until April. Our earliest variety is called Rjindvelts Early Sensation, and we usually pick our first bunches on Boxing Day. We also grow Double Daffodils where the flower has double petals, giving it a much fuller appearance and without the pronounced trumpet. Our Daffodils are not always yellow, we have different white varieties and will include these when they are available in our Daffodils by Post boxes. We always pick our daffodils in tight bud, so that they open up on arrival to give maximum enjoyment to the recipient.